This sound relaxation machine can help create perfect sleep environment for you and your baby. You can fall asleep quickly with any one of its 20 relaxation sounds, which can also mask undesired distractions to improve your concentration while reading, working or studying. 【20 SOOTHING SOUNDS】Built-in 20 soothing sound(lullaby 1, white noise, pink noise, grey noise, brown noise, fan, craking fire, clock ticking, train, crickets, frogs, birds, rain, thunderstorm, stream, ocean, shush, womb sound, lullaby 2, lullaby 3), design to mimic the natural environment to provide the most relaxing. 【AUTO-OFF TIMER】 The sleep sound machine therapeutic sounds can be used for relaxation, sleep, work, travel, study or meditation. You can choose to play the relaxation sounds continuously, or choose from the auto-off timer. The timer features 3 options: 15, 30, or 60 minutes. 【HEALTHY SLEEP】White noise can enhance sleep quality, create relaxed atmosphere, improve concentration and mask inside or outside undesirable noise for you and your baby at home, office, dorm, kids room, nursery etc. 【SAFE MATERIAL】ABS material is environmental, safe, non-toxic, odorless and harmless, support earphone listening, power is supplied by USB or battery(not included), which is convenient. 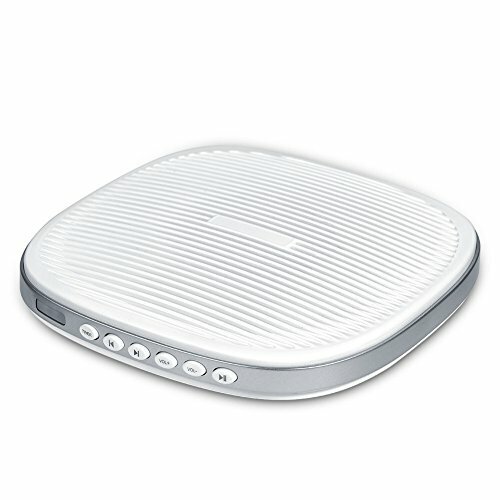 【PORTABLE SIZE】Don't worry about not sleeping while you travel, the sleep sound machine is small and lightweight. It easily fits into your purse, bag or suitcase, are ideal for travel use.